Over the weekend #womeninfiction emerged on Twitter, so in running with the theme I’m here to share with you a few of my favourite fictional ladies. The Elegance of the Hedgehog – Muriel Barbery. Renée Michel is possibly my favourite literary lady of all time. She is a concierge, and self-confessed member of the lower class. Despite how she outwardly appears, she is in fact fantastically intelligent, but she knows her place, and sticks to it, stating that to be “poor, ugly and, moreover, intelligent condemns one, in our society, to a dark and disillusioned life, a condition one ought to accept at an early age”. Madame Michel prefers to lives a secret life, reading Russian literature in the privacy of her lodge while donning the air of a simpleton when speaking with the inhabitants of the apartment complex where she works. In Renée, Barbery has created a fantastic female heroine for lovers of literature. I challenge anyone to read The Elegance of the Hedgehog and not feel themselves brimming over with admiration for the soft soul nestled within the prickly exterior of Madame Michel. Petronella is an 18-year-old Dutch girl whose family have fallen on hard times since the death of her father. She is married off to a wealthy merchant from Amsterdam, Johannes Brandt, but has a difficult time fitting into her new life. Petronella, who prefers to go by the name of Nella, attempts to be a good wife to her new husband, but is forever at the mercy of her stern sister-in-law Marin Brandt. Nella begins as a child, before all too quickly becoming a woman, when the crushing weight of her new family’s secrets is placed on her shoulders. What is there to not love about Nella? In each stage of her growth she is simply delightful: innocent and charming, determined and strong, and finally, reliable and level-headed. Jerusha Abbott, or Judy as she likes to be called, was brought up at the John Grier Home, an old-fashioned orphanage. At the age of 17, she find herself at a loose end, she has finished her education, and is no longer young enough to live in the orphanage without paying her way. Imagine her surprise when one of the John Grier Home’s trustees offers to pay for her to go to university. He will pay her tuition and also give her a generous monthly allowance; in exchange Judy must write him a monthly letter. Judy is told she will never know his true identity and must address the letters to Mr. John Smith, and he will never reply. Judy warms quickly to the trustee, gifting him the persona ‘Daddy Long Legs’, and writing warm, detailed letters each month. Judy dotes on her Daddy Long Legs, and, it appears, he on her. Judy is an amazing character, gifted with the unique opportunity to turn her rags to riches. Read Daddy Long Legs and I’m sure you will find, too, that you fall in love with the little orphan girl and her extraordinary tale. Georgianna Lennox is a local medic on a foreign planet ruled by alien invaders, the Adveni. The native people, the Veniche, to whom Georgianna belongs, have become slaves in their own home. Georgianna is somewhat unique among the Veniche as her work allows her to tread within the realms of the Adveni forces, treating the sick and injured within the walls of the infamous Lyndbury prison. For Georgianna this is a way of treating her lost people, but it is not enough. When Georgianna’s friendship with a group of rebels risks putting her own freedom at stake, she is faced with a difficult decision – what will she choose to put first, her family or the freedom of her people? Georgianna is a strong, determined character, but one I felt extremely comfortable getting to know. Cooke has created a character that is admirable, but also wonderfully human. I found her to be amazingly likeable and funny, despite her hard exterior. Are you sick of me talking about Edwina yet? If you are, shame on you, you clearly haven’t taken the time to read the book. Edwina is the spirit of a young woman trapped between the early 20th Century, and modern day Britain. Since her death she has lurked the shadows of her former home, critically analysing those who take residence within the walls. In Now the Day is Over she takes the form of super-omniscient narrator, haunting the house which was once hers, commenting on the lives of the adulterous couple who reside within her domain, comparing their existence to the life that was once hers. I love Edwina because she is so all encompassing. She is deliciously genuine, admirable, maddening, terrifying and somewhat detestable all rolled into one. Intrigued by any of my lady loves? You know what to do. Another children’s classic, the picture book. It is unusual for me to try and review a book with no words at all, but a challenge I accepted and enjoyed to the last. This is the question presented to a young girl, in Henry Cole’s haunting tale of a young slave’s journey to freedom. 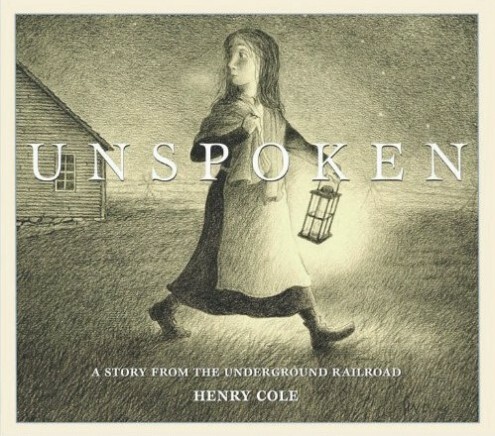 Unspoken is a beautiful example of a children’s picture book with illustrations that are filled with emotion and can, on their own, tell a strong and provocative tale. Cole has taken something which is often associated with children’s literature, a picture book, a wordless story, and created something beautiful. That is not to say that picture books can’t appeal to adults. Children’s classic such as The Snowman, and Father Christmas are stunning and offer equal entertainment for adults as they do for children. Indeed, the tale told in Unspoken can speak more toward an adult audience as the innocent child is unlikely to grasp the full extent of sadness that underlies the beautiful artwork. To the child the book may appear as nothing more than a story of young girl with a secret friend. Without words, the young girl who lives within the illustrations of Cole’s work is almost a stranger to us; we do not know her name, or very much about her life. However, from her actions it seems as though she is from a less than well off family. Cole draws her working on a farm in tattered clothes, leading cattle and feeding chickens. It is while carrying out chores that the child sees men on horseback riding through her family’s farm, they are searching for something, and she is soon to discover the whereabouts of their quarry. Sent to the barn to gather supplies she is startle by a sound coming from a pile of corn – there is someone there. If we knew little about the young girl, even more mysterious is the identity of the runaway. We see only their eye peeking through the ears of corn, and later, their thankful hands, reaching out to receive food encased within the young girl’s handkerchief. In my mind I have given the runaway a female identity, although each reader will have their own feelings on this matter. The worry etched on the young girls face as she hides this secret says far more than any words could express. Her concern seeps from the pages, a combined anxiety for the creature in the corn, and that she will be discovered harbouring a fugitive. She watches with clear disdain as men on horseback visit her father once again, offering a reward for the return of an escaped slave. You can see that the family live a simple life, likely a reward would be very gratefully received, and yet the young girl looks on, in silence. Our heroine, beautiful in her innocence, seems only to think of the safety of the figure in the corn. She follows her heart, as the runaway follows the North Star, away from the South, to freedom. When she returns to the barn and finds the runaway gone, leaving behind a small token of thanks, she knows she has made the right choice. Without a single word Cole’s book speaks mountains. There is no colour, no creed, no judgement, just a person, helping another person. In his author’s note Cole writes that he hopes that those who read the book will use his pictures as a starting point to create their own story – filling in all that has been left unspoken. Which side is the ‘right’ side? Suzanna Linton was born in South Carolina and grew up in Orangeburg County. After graduating high school, she attended Francis Marion University, where she majored in English. Linton tells of how she began writing as a child, after feeling as though she was brimming over with ideas and needed to ‘share them before they poured out of my eyes and ears’. An initial penchant for experimenting with poetry grew into a love of writing fiction. Linton currently lives in South Carolina with her husband and pet dogs. As well as writing fiction, she works in the local library. Her debut novel, Clara, was published in 2013. Linton’s book follows the journey of Clara, a seemingly ordinary child to whom life has been anything but kind. Having being sold into slavery, Clara loses the ability to talk, her voice forced deep inside of her by the horrors she suffered at the hands of the slavers. Bought by a wealthy master, Clara falls into a dreary life working in the castle kitchens, never venturing further than the kitchen garden. She is known by no name and those around her see her as nothing more than a mute slave girl who is possibly a little slow. But, unbeknownst to those around her, Clara holds the unique ability to see into the future, a gift she has kept secret for years through fear of persecution. 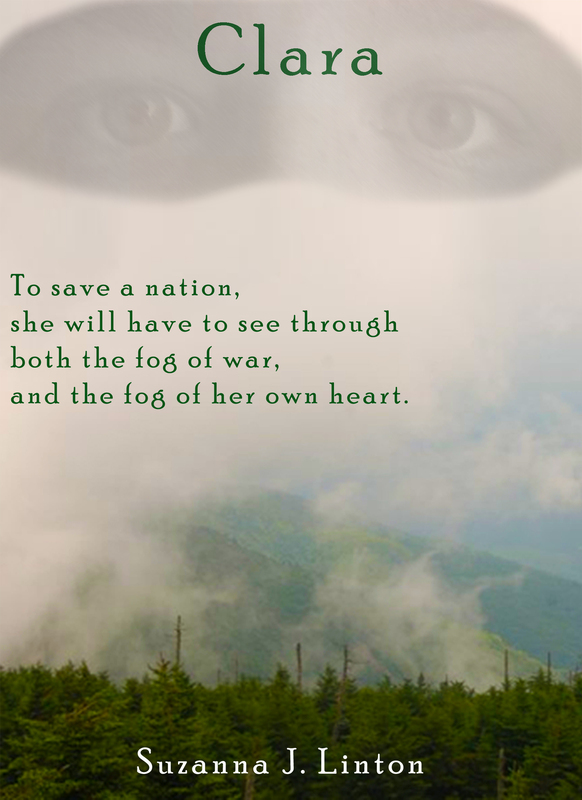 When a vision prompts her to prevent a murder, she finds herself catapulted into the lives of the nobility, and the centre of civil war that threatens to destroy the country. In a journey that takes her from her humble roots to the capital city itself, Clara discovers that the future of the nation depends on her and her alone. Later in the book she is given many more luxuries and presented with beautiful clothing, ladies in waiting and guards to protect her, but it is never enough to make her happy. In some ways, Clara can appear as an unlikable character: she is angry and untrusting, miserable most of the time, and does not appreciate the things she is given. However, I think this makes her character all the more genuine; it is natural and very human for Clara to behave the way she does. Regardless of the gifts and luxuries Clara is given, she has within her always the desire to break free of the slave’s collar, which remains symbolically strapped round her neck until the end of the book. As Clara becomes more and more entwined within the politics of the civil war she faces situations that challenge her allegiance, often leading her to wonder which the ‘right’ side is. Clara’s abilities render her invaluable to both armies and, as such, she is vulnerable to manipulation. Both sides hide the truth from her in one way or another, and it is left to Clara to decide for herself who she should put her trust in. Sometimes, doing what is ‘right’ can have unforeseen repercussions. Clara’s confusion towards the love she receives is a central theme throughout the novel. She finds it difficult to know how to feel about any of those who flatter her: can they really be trusted? Her nature makes her guarded towards any advances. I thought it was inevitable that Clara should fall for one of the men in the book, but was very pleased that, ultimately, there is not a fairy-tale ending. Too often heroines give up on their dreams because they fall in love. Most prominently within Clara is the desire to escape, to be free, and to discover herself, and she makes the choice to put these dreams first, and perhaps to come back to love once she has discovered herself. As with many of the books I review, I do have a couple of small gripes to add before I round off. Firstly, I feel the text could do with a professional edit as there are quite a few mistakes in the text. However, I do feel this is inevitable with a lot of self-published work, and I don’t feel that the mistakes overly detract from the story. Secondly, I feel that at some point events are perhaps drawn out a bit too far, and what could be described in a few pages takes up substantially more. I personally like to keep things concise. That said, I feel these are fairly minor details. On the whole, I found Clara to be an enjoyable read. The storyline is entertaining and keeps you wanting to read on at the end of each chapter. I would be interested to see where the story goes next and in finding out the answers to some of the questions left hanging at the end of the book. I feel Clara would best suit a young adult audience, and fans of medieval fantasy. All due thanks go to Suzanna Linton for providing me with a free review copy of the book.